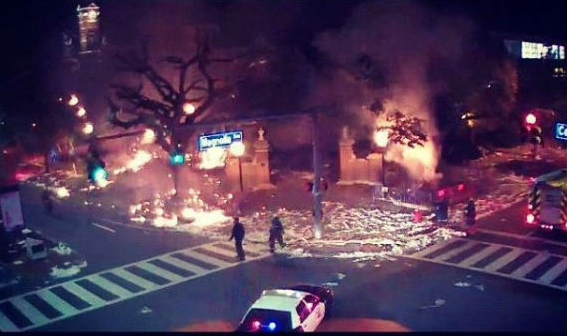 The toilet paper hanging from the Toomer’s Oaks after the celebration of Auburn’s Saturday win over Alabama A&M caught fire early Sunday morning. The Auburn Plainsman reports that the fire started at approximately 3:20 a.m. If police have any details related to what started the blaze, they won’t be released until Monday. Here’s what appears to be a screen shot of the Toomer’s Corner webcam feed that seems to suggest Summerfield’s fears were justified. It’s not just the toilet paper in the trees that’s up in smoke—the toilet paper scattered on the ground, which these days typically makes its way well onto Samford Lawn—also appears to be burning. This is the second time in just over two years the oaks have caught fire after being rolled. The blaze that engulfed the toilet paper left in the trees after the 2010 Auburn-Georgia game was actually the result of three separate fire incidents. Photo: MyFoxAl.com; h/t @AubOrange, @bmiller_star. At no time has the TP in the oaks just caught on fire. Every time it has been the result of stupid georgia and bama fans committing arson.